TA300 is the latest mobile time and attendance device from FingerTec, a desktop standalone fingerprint reader that does not require installation. Combining simplicity and mobility, TA300 is ideal for "attendance on-the-go" environments such as training centers, tuition centers, construction sites, etc. With an up to 5 hour internal battery, TA300 provides extra convenience to users--at a competitve price. TA300 is perfect for small and mid-sized companies seeking a cost effective T&A system to increase efficiency in managing human resources. Employees check in and out using TA300; at the end of the day, data downloads via USB cable into a PC with TCMS V2 software for attendance reports. TA300 can store up to 500 fingerprint templates and 30000 transactions per terminal. TA300 really gives you value for your money! Choose TA300 for simple attendance and attendance on-the-go. No Installation Needed - The TA300 is ready to be used straight out of the box without any hassle of wiring. Just mount it on a surface, and it's ready to be used. Battery Powered - Don't let the issue of power supply bother you any more. The TA300 has an internal battery that can last up to 5 hours under normal usage. Easy Data Management - Uploading and downloading of data is still possible with the TA300. Data Management is done simply with a USB cable. Get ready to Plug & Play! Easy Administration - The TA300 has a simple to use administration system. Enroll a user by pressing the "Enroll FP" Button, and Delete User by pressing "DelUser" button. Period. 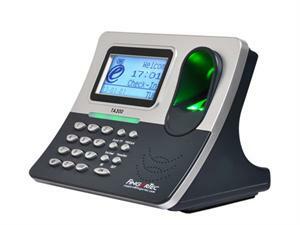 The Biometric with Stability - The TA300 has a wide base for stability, and is designed to be placed on a flat surface. This make it suitable to be used in smaller businesses and centres. Small in looks, big in storage - The TA300 may look small and complact, bit it is able to store 500 fingerprint templates, and 30,000 transactions at one go. This means less frequent downloading of data for you. Value for Money - The TA300 was created especiaaly for small to medium business sizes. Having said so, you'll find that the TA300 is a value for the money as it is highly affordable at a very competitive price. Fast Paced & Versatile - The TA300 gives you an option of identity verification through finger print scanning or password. On top of that, fingerprint verification is done within a second!